From the middle of the nineteenth century, a conversation was held in Calais to keep the memory of great people for many years. For this it was necessary to create a monument in which you can see the feelings of the French: and discomfort due to surrender, and the worship of the heroic dedication of their people. But the administration did not have the means to order the monument from famous masters. And in 1884, Devavrin, the mayor of the city of Calais, organized a collection of donations for the monument on the lists. And the work was ordered by Rodin. At the end of the nineteenth century, the work of the sculptor was considered controversial. Therefore, all were waiting. Roden worked on the composition from 1884 to 1888. It was expected that one of the figures would be a symbol of Eustace de Saint-Pierre. All monuments were performed earlier on pedestals. But Rodin did not make it. He believed that it would be better to look at the sculpture at the same height with the audience. Although the figures were made above ordinary people. For the first time the townspeople saw the finished composition in 1889. All came to the delight of the work done. And the official opening ceremony of the monument took place a few years later in 1895 in Calais. But the authorities ensured that the sculptures were installed on a small pedestal and fenced. But Roden wanted his job to be at the bottom. Therefore, his will could be executed in 1924, after the sculptor died. 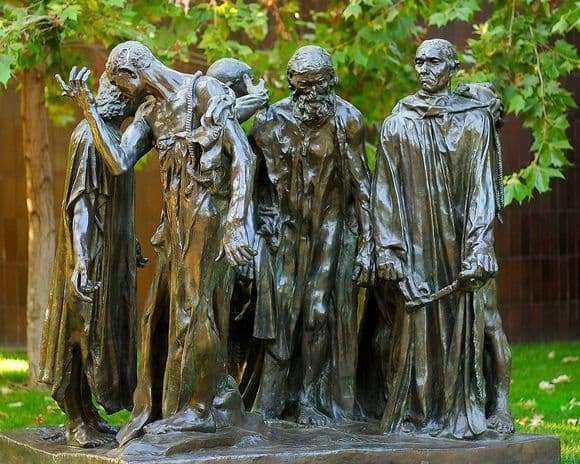 Rodin’s composition was all imbued with dramatic content. An expression of tension froze on the faces of the sculptures. But each figure has its own characteristic. Since the sculptor created a contrast between them. This is observed both in the poses and in the gestures of each hero. There is a complete static character of the figures, their unusual dynamism. The expression is felt in all the features of the created creation.